At 40 years of age, Drew Brees is still as hungry and as hellbent as ever. 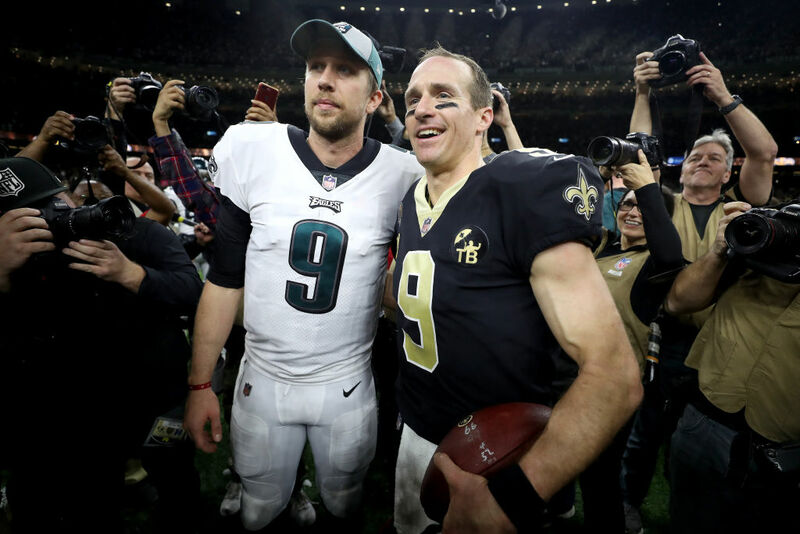 The New Orleans Saints haven't been to the Super Bowl since 2010 but their legend quarterback who brought them to history then is intent on giving them another bow on one of the biggest stages in the world. On Sunday night, the Saints host the Los Angeles Rams for a place in Atlanta after a second half of grit and character saw them slug it out over the Eagles in the Divisional Round and win 20-14, keeping the opposition scoreless for the final two quarters. Brees was typically instrumental, pushing team mates into positions they weren't even looking at and dragging the Saints up the pitch like clockwork. And his 18 years as an NFL player have helped accumulate enough experience for the iconic number nine that he can not only say that he's been there and done that, but he can give it straight in a huddle about what he sees now. And he sees a winning team that can go to a level not many can go to. It all came out in his inspiring speech just before the first drive at the weekend. "Hey, listen to me now! "There's three stages to this game. You play, you compete and lethal. "When you're a kid, you play. You play because you love this game. You love the game of football. "Then you tarted learning fundamentals. You started learning technique. You started learning how to compete. And how to win. "Then the third stage... not everybody gets to the third stage. Not everybody gets to be lethal. "But when you get a group of guys, a team like this that love one another, that play for one another... that's lethal. "When you go into every game and know that you got a chance to win - no matter what the circumstances, you will find a way to win - that's lethal! "All season long we played. We competed. "And tonight? We are lethal!" He had Michael Thomas hanging off his every word and the pair formed an unbreakable connection that was a consistent supply line for the Saints all night. Thomas has been absolutely brilliant again this season and, on Sunday night past, he clocked up another 12 receptions totalling a crazy 171 yards as Brees sought out his reliable wide receiver time and time again. After the game, Thomas was still pumped, maybe with his captain's lethal words still ringing through his ears. But as much of a winner as Brees is, he's still a touch of genuine class 'til the end too.